God's Church Circles the Globe! Now it was not too long ago, there was an editorial in one of our largest news magazines, 'The United States News and World Report.' It said that it would seem that the only hope of survival of humanity now, is the sudden appearance of a strong unseen hand from someplace — to intervene in world affairs and save us from ourselves. Let me tell you we're very close to that time and that very same thing is going to happen. World famous scientists have been saying now for the past ten years and more, I would say for the last twenty years. They have been saying that our only hope is one world government. Having one military force. Where there are no armies in other nations that could come to war, only the one nation. No world wars of any kind. But brethren, they overlook something. We still wouldn't have peace among ourselves. What about the home and the family relationship? It's on the way down and out in the United States and Britain and Europe, in the entire western world and the rest of the world is following a little bit slower after us. They're adopting our western ways in China and Japan; they're adopting our western ways in India, and in other parts of the world, in South America and all over the world. They've adopted everything that is wrong in American music. They're adopting everything that is wrong, that is going out, that has been spawned in the United States and that is going out to the rest of the world. And that is the kind of world you live in today. Brethren, we've gone past the place where we can save ourselves! The scientists who say that the only hope is a world government will say in the same breath it's utterly impossible in the hands of human beings. And it is, and we couldn't bring it about. No, I tell you, it's like the editor, well, he's now former editor of 'The United States News and World Report,' that that unseen hand from someplace is going to have to intervene and is going to have to save us from ourselves! Humanity will not save itself, humanity is on the way down, down down and out! Thank God there is a Creator God above that isn't going to let us go all the way out. So listen to me with this message! Yes, I'm an old man, I'll soon be ninety years of age, I'm senile, my mind isn't working anymore. I was supposed to be a high school dropout, I was supposed to be a failure in business, although between ages 25 and 28 I was making from one hundred thousand to a hundred seventy-five thousand dollars a year, according to the nineteen eighty dollar value. So that be failure — how many young men that age are making that much today? Well I'm supposed to be a lot of things to people that don't like God and don't want anything to do with Him! If I didn't believe God and I say believe God, here's His word in front of me! I believe it! I know a lot of ministers that pretend to be the ministers of Jesus Christ; they don't believe what God says in this word! I do believe it. Now in order to believe it I had to give up what had been stuffed in my mind. What is education like in this world? You know, back in the year 1927 I envisioned a national magazine, 'The Plain Truth'. Oh, just a vision. Of course, how would I ever start it, where would I get subscribers, how could I afford it, how would I have it printed? I didn't know. I just knew it ought to go out. I wrote an article, I employed a professional letter artist to draw up a front cover for me, and it's a good deal the same front cover we have on there today. I left room for pictures as something in the front cover but the masthead was the same. Of course that magazine is being published now and has been a great many years with a circulation of going on toward three million copies, three millions subscribers monthly. Today it's one of the mass circulation magazines of this world. I had a picture of education. I wrote an article, it's never been published, I don't know what happened to the manuscript. If I could find it I'd publish it today. I might do a little re-write on it but I would run it. It was an article on stuffing lies into your child's head. And I had a picture of the school room with children in that room sitting at their desks. Every child had a funnel stuck in the top of his head. And here was the teacher with a great big pitcher and on the pitcher was labeled, "false, untrue knowledge". And she was pouring that false propaganda and false knowledge down through the funnels into the child's head. And they were expected to believe. And when final exams come along if you don't report on what you've been taught, you're flunked. And it's like a grandson of mine when he was in one of the grades growing up, and teacher one day asked him to recite and said, "Larry, tell me, see if you know who discovered America." Larry said, "Yes ma'am, the Indians." Well, the teacher said, "Larry, now you know better than that, you know Columbus discovered America." He said, "No ma'am I don't." He said, "weren't the Indians already here long before and waiting here to welcome Columbus when he finally got here?" The teacher flunked him. He was supposed to believe what he was taught, no matter how false it is. That is our system of education today! Education is something that you get like you go to the store for a loaf of bread. Which reminds me, one of our children, when they were young, didn't like milk that came from cows, she wanted milk that came from the stores. When, we went down to visit some relatives on a farm one time, she saw milk coming from cows, she said, "I don't want to drink any milk that comes from cows." She — we lived in the city and she only knew about milk that came from stores. Well, you go to the store for a loaf of bread, instead of baking it at home of course today. And, you put your money across the counter; they put another piece of paper around the bread which is already wrapped anyway, and you go out with it. So you bought your loaf of bread, you go home — that's the way you get an education today. You go to school, and you let them stuff something in your mind! And education in this country is a process of memory training. There's something wrong with it. And so the Eternal God put it in my mind to establish a college. A different kind of college, where we wouldn't teach a pack of lies, but where we would teach the truth. And where do you go to get truth? The world doesn't know, isn't that too bad? Brethren, I had been stuffed with a lot of false knowledge too, up until age thirty-four and at age thirty-four I was challenged. And I began to study the Bible because I wanted to prove that what the churches all say and what had been taught me in one of the very highly accredited and responsible or highly esteemed protestant denominations. And I'd been brought up in Sunday school until I was eighteen, but somehow religion had never caught hold of me and at eighteen I dropped out of church and of Sunday school. Oh, I'd visited different churches once in a while, sometimes a Baptist, sometimes a Methodist, sometimes other churches. But I knew that I believed certain things. I believed the immortality of the soul. I believed that when you die you go to heaven or go to hell; depending on how you've lived. I believed a lot of things like that. I believed if you just professed Christ at some time in your life that you'd go to heaven. And I began to study the Bible. And I began to see that the Bible said precisely the opposite of a lot of those things I believed. And there it was in plain language and here I looked at it and it said so! Well, course that's the English language and I said well that was written originally in the Greek language. Or in the Old Testament that was written originally in the Hebrew language. And so I looked up the Greek and the Hebrew and I found that God says…and I went on and studied and I proved this is the Word of God - this Bible is God speaking to you in print, and speaking to me. Now was I going to give up what I believed when I saw it was just exactly opposite to what I read here and what God says? I had to decide what I believed, what men taught me, what church taught me, what school taught me, that came from other people and organized human society, or will I believe what God says? And I believe God and that's the whole difference right there. That is the difference! How many leaders in the world of Christianity are there like that? No no, what they've been taught they will, "but that's been church teaching all the year and I got to believe it. Ah, maybe I just don't understand the Bible "...so they go on believing what other men, other people stuffed in their minds. That's what they believe. Well brethren, why are we here? As I said, we're here to celebrate a foretaste of that Utopia that is coming. A world of peace, a world of perfect government. But the Eternal God the Creator's going to have to intervene with that strong hand from someplace and is going to have to come and save us from ourselves and establish the government of God Almighty the Creator. There will be perfect peace, there will be perfect government and there will be at last perfect education, think of that! Today people laugh at the word 'Utopia' well, why should we laugh at that idea? Because we have never had it in this world and we can't understand how we could ever come to have it. We ought to have it, why shouldn't we have it, why? We're living in a very sick sick world. This world is full of every evil you can think of. It's filled with illiteracy, it's filled with poverty, it's filled with starvation, it's filled with violence, it's filled with wars. Weapons of mass destruction exist now that can erase all human life from this planet. And just last night on television I saw a discussion of so-called authorities, and men that are supposed to be in the know, men in government and men in educational high places, about the proposed development of chemical warfare in the United States. Should we or should we not go ahead with chemical warfare? That's one of the big problems the President has to consider now and the candidates for the Presidency. But this is a world that is full of crime, it is full of immorality, the family structure is being broken down completely. Kids live a life of their own; they don't eat at home with parents anymore, wives are not at home taking care of the children. Only thirteen percent of families in the United States now have a husband, a wife at home and two or more children. I think I should say one or more children I believe the statistic is; I forget the exact figure of the statistic. We're down to thirteen percent. And the solid family structure is the basis and the foundation of any solid and any perfect and any enduring civilization. What does that mean? It means we are on the way down and out, unless you can arrest that trend. There's one of the causes of the troubles lying ahead. So, we're filled with crime, immorality, corruption; corruption is in politics, corruption in business, corruption is everywhere. A hopeless world, offering no hope to the world, young people stare a hopeless future in the face, so they are frustrated. We're living in a world of pain and suffering and sorrow and too much suicide, and suicides are increasing very rapidly like everything else that is bad. So I say to you, Utopia is coming in this generation. God Almighty — I thank God every day and every night that the One Supreme power is a power of good, a power of love, of outflowing love toward all of us. I know there's another very, very evil power, that is invisible, and being invisible people don't believe that power exists. It isn't fashionable to believe in the devil today, no that's not very fashionable. But I thank God that there's One Supreme power and that that Supreme power is based on love that is outgoing love toward others, not incoming love that isn't love but lust. A God who is more powerful and can put down and will put down every other power. Oh, I thank God for God Himself. But most people don't like God. I'll tell you why I'm persecuted, because I'm a man of God. Because I believe God and not only believe in God, a lot of people believe there is a God, that's alright. A lot of people are going to believe that. 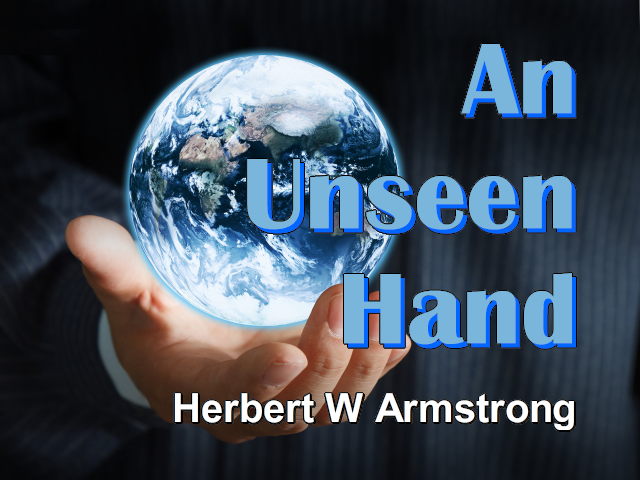 I, (Mr Armstrong chuckles) I think if I believe in the kind of hell people talk about I would say hell's paved with that kind of people — who believe there is a God. No, it's a lot more than that. Do you believe God, do you believe His way is right? The government of God is coming, and what is government? Government is based on law; government is based on a basic constitution or a law. And a law or a constitution merely is a way that regulates our lives; it's a way of life, a lifestyle. And the only trouble is we have laws that allow wrong lifestyles and wrong ways of living. And we're going to have a government that will be based on the law of God which is outflowing love. Now that's a little too much for people to get because love has come to mean lust. They change the meaning, so I put it in simple words that a six year old child can understand. The right way of God is give. God is the great Giver. Jesus Christ said it is more blessed to give than to receive (Acts 20:35). The other way is get. There are just the two philosophies of life — you have to go one way or the other. How are you living? Is your motivation what you can get? Is your motivation accumulating, is your motivation vanity, exalting yourself, you want the chief seat for yourself, you want the big thing for yourself, you want to be looked up to, you want what you can get, you want how much you can own? Well, if you're not like that you're a funny individual in this country, or in any other country for that matter, because that's the way human beings are — yes human nature too. Why do we live in a world like we do? There has to be a cause for every effect. Something had to cause it; something is continually causing all of the troubles in this world. But people are trying to deal with the effect and you never can cure the effect until you get to the cause and change that. Now you can say the cause is human nature but people don't understand human nature, they don't realize what it is, they don't know what is its origin; they don't know where human nature came from.You think God created human nature in people? Human nature is an evil attitude that wants to go the way of self, self-centeredness, the way of get. God did not create that way and God's law and everything about God is just the opposite way — just the opposite. Something has caused the present world upset and chaos. Now you can go to listen to the political speeches, they'll tell you, everyone says, "Vote for me — I'm going to straighten everything out. I'm going to reduce taxes but I'm going to give you everything". And you know everything the government gives you is only what they can take from the people in the first place, and they give part of it back. And people don't realize that, but people want to get, so they want to get from the government and they vote for the man that'll get — that promises to give them the most, so that they can get the most, and then they don't like the taxes and so the government then prints more money and that causes more inflation. And people wonder why we have inflation. If government were properly run we wouldn't have any and in tomorrow's Utopia I'm talking about, that we're here to celebrate there won't be any inflation. And there won't be any unemployment, and the budget will always be balanced. Now what do you think of that? And let me tell you something, children and their parents are going to eat together at home. Kids go to movies by themselves and they want to go to X-rated movies if they can manage it. Or else they spend hours and hours a day on the one-eyed monster. And television is a business, and business is in business for profit. And the television managers know that what people want — and you know, it's the old saying, "Jones pays the freight — give Jones what he wants". And what does Jones want? He wants to be entertained, he wants to be amused, entertained. So, television is pure entertainment, even the newscasts are entertainment. Don't you kid yourself they're not. That's why people look, so they have one kind of entertainment for kids. What happens every Saturday morning on television? You don't find adults looking in, that's for kids; but kids also look in the rest of the time. And what do they see; they see illicit so-called love that's only lust. They see everything wrong, everything that is contributing to all of the troubles we have in the world and that's what kids are being fed. They see violence, they see people getting high on drugs, "and I think maybe I'd better try that". They see everything wrong, so that is plenty of causes in this world. But something is going to have to cause that Utopia I've been telling you about. What in the world could cause that, how do you expect human beings to change? Frankly, I don't. You people are not going to change, the people in the world are not going to change. I think you, or I hope most of you people in this audience have already changed. I hope you've let God change you, by putting His Spirit within you. During World War II, Winston Churchill, one of the greatest men in English history — at least in recent English history certainly — spoke before the American Congress, and he said to the United States Congress, "there is a purpose being worked out here below." Indeed there is a purpose being worked out here below and is being worked out from God above. Now what could be that purpose? Why are we here? Why did God put humanity on the earth? How did we come to be here? You think we just grew out of a brainless amoeba? And that we came by evolution?